Which FoodSaver Vacuum Sealer Is Best? FoodSaver vacuum sealer models dominate the home vacuum sealing market. So you’ll definitely be spoiled for choice if you're specifically looking at this brand of vacuum sealers. It’s compact so it won’t gobble up your precious kitchen countertop space. It's manually operated. This allows you to control the strength of the vacuum suction. So you can stop it before it crunches your food. In addition to the manual operation, a CrushFree Instant Seal mode helps to protect especially delicate foods during sealing process. Think of it as additional protection against mashing up your food. The drip tray is removable and washable so this vacuum sealer is a good choice if hygiene is important to you. Plus, this tray is dishwasher safe. So, you don’t have to wash it yourself and risk chipping your beautiful nails. Just remember to put it on the dishwasher's top rack. It comes with an accessory port and hose vacuum seal canisters that make marinating your food a breeze. Although it’s normally priced at $99.99, you can get it for 30% off this price at Amazon, where it currently goes for $69.50. But hurry! The price could go up anytime. 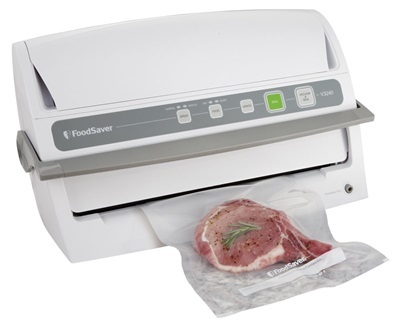 The FoodSaver vacuum sealer model V3240 is hot off the press and utilizes new technology. It prevents freezer burn. 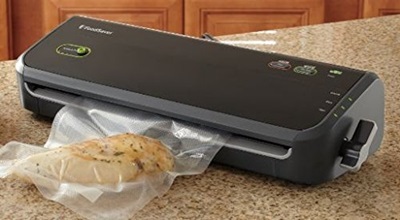 This FoodSaver vacuum sealer uses a heat seal to keep air out of specially designed vacuum bags. This helps to keep your food fresher for longer. It minimizes bag wastage. Because of the new technology it employs, bag wastage is minimized as it uses 40% less bag material compared to the traditional FoodSaver vacuum sealer models. Of course, less bag wastage translates into more money savings. 5 year warranty. FoodSaver is so confident that this machine will serve you well that they accompany it with a 5 year warranty. That is 5 times the normal 1-year warranty! This means that any defects in parts and labor that existed at the time of purchase but were not apparent will be fixed at no additional cost to you. 5 years is a long time, so be sure to keep your receipt in a safe, memorable place. Removable drip tray. It has a removable drip tray, which collects all the liquid overflow and makes cleaning up easier. Easy operation. All you have to do is place the bag filled with food into the vacuum sealing chamber and close the latch bar. Then simply press the vacuum/seal button to start the sealing process. FoodSaver takes care of the rest. And all you have to do is pop the sealed bag in the freezer or pantry when the process is done. Bonus. What use is a brand new vacuum sealer if you don’t have freezer bags or vacuum sealer rolls to use it with? The guys at FoodSaver have your back and besides the sealer, you’ll find 3 quart, 2 gallon freezer bags and an 11 inch x 10 feet vacuum sealer roll in the box. That way, you can start sealing right away. Plus, you’ll find a handy accessory hose so that you don’t have to spend your savings buying this separately. The FoodSaver vacuum sealer system model # FM2000-000 is the third fastest selling sealer in this category. New technology. Because it uses modern technology, bag wastage is minimized. So it uses 40% less freezer roll material than the traditional FoodSaver units. It’s a great choice if you want your rolls to last longer so that you don’t have to buy them so frequently. Remember, "a penny saved is a penny earned." 5 year limited warranty. 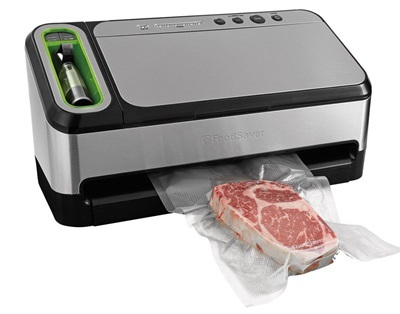 FoodSaver is so confident you’ll love this vacuum sealer that they back it with a 5 year limited warranty. 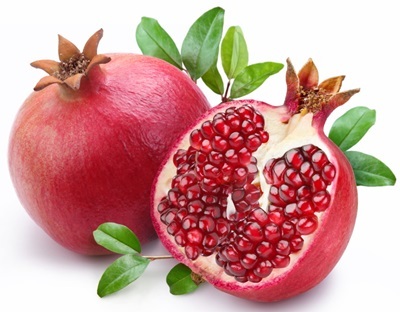 In effect, FoodSaver will, at their cost rectify any manufacturing defects that existed when you bought the sealer. Just remember to keep your receipt handy. This vacuum sealer comes with a removable drip tray that catches the liquid overflow before it leaks to the kitchen counter. That way, you don’t have to clean up the mess afterwards. What’s more, the tray is dishwasher safe. Just remember to put it in the top rack of the dishwasher because it’s delicate. Time saver. Time, they say, is the greatest resource we all have so we need to use it well. So how does this FoodSaver vacuum sealer save time? Well, simply place the filled bag in the sealing chamber and close the latch and the sealer will quickly deliver the sealed package. All you have to do is toss it in the fridge. Bonus: Starter kit. The vacuum sealer is ready to use when it arrives. This is because it comes with a freezer bag starter kit. This kit consists of 3 quart bags, 2 gallon-size bags, one 11 inch x 10 foot vacuum sealer roll and an accessory hose. Cheap. With all the above benefits, you’d think you’d have to shell out well over $100 for this sealer, right? Wrong! Even though the recommended retail price is $99.99, you can buy it online for a measly $69.99. So if you can’t find it at your local appliance store at this price, be sure to check it out at Amazon. If you are looking for a FoodSaver vacuum sealer with some bells and whistles, be sure to check out the FoodSaver 4840 2-in-1 Vacuum Sealing System. A countertop vacuum sealer in classy black and stainless steel finish. So it’s a functional beauty! Both dry and moist food settings. So, you can choose the one most suitable for the job at hand. That way, you won't squeeze all the moisture out of your steaks. An inbuilt roll storage area. This tucks the rolls neatly away and keeps the kids or kitten from unfurling them around the kitchen because just rolling them perfectly back onto the roll core is a chore. A bag cutter. So, you don’t have to scramble for your kitchen scissors every time you need to vacuum seal food. Or have band aids nearby, too. A built-in retractable handheld sealer. It seals zipper bags, canisters, containers and also marinates food in minutes (not hours!). So although the manufacturer markets it as a 2-in-1 vacuum sealer because of the countertop and handheld sealers, it really is a 3-in-1 vacuum sealer when you factor in its marinating capability! It comes with a starter kit that includes: 3 quart zipper bags, 2 gallon zipper bags, 2 quart heat seal bags, 2 gallon heat seal bags and an 11 inch x 10 feet roll. So you’re all set to start sealing when the package arrives at your door. It’s also a good way to find out which freezer bag and roll sizes work well for you before you buy them in larger quantities. That way, you don’t waste money on those that are too small or too big. It’s black. This means it won’t stain easily. It’s also bound to add a touch of class to kitchens with dark decors. After all, black really is the new cool! So if you’re looking for a versatile vacuum saver that will keep your fruits, prepared salads and deli meats fresher for longer in the refrigerator, and extends the shelf life of your spareribs, this one is right up your alley. Protect important documents like a passport or birth certificate. Replacing these is such a hassle and this vacuum sealer makes sure they won’t stain or soak up water. Protect your polished silverware tarnish and scratch-free and ready for setting the table. Keep your silver jewelry looking magnificent and ready to wear. Prevent liquids from spilling in your suitcase and staining your clothes by vacuum sealing the leaky containers before you travel. 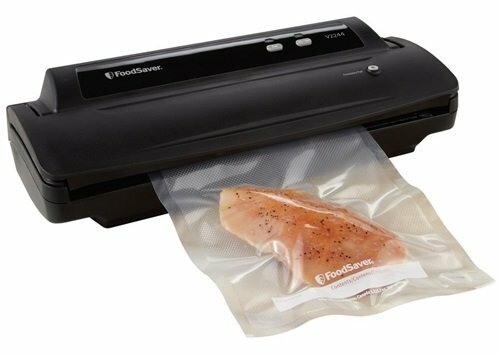 Visit your local appliance store to see whether they have the FoodSaver 4840 vacuum sealer.